Sanity Claws Radio – World Building 2.0 with Minnesota Mike! We get out our imagination caps as we do a second round of world building with Special Guest Minnesota Mike in this episode of Sanity Claws Radio. Scotty, Karen, Steve, Jon, Badger, and special guest Minnesota Mike decide to build some fantasy worlds. We expand upon our previous World Building show and create a back story for our entire universe! Also, Mike catches all of the things, Steve, Scotty, and Karen get Magical, Badger invade Germany and Jon tries to find Teddy. And finally, we finish off the show with a chaotic round of I Can Top That. 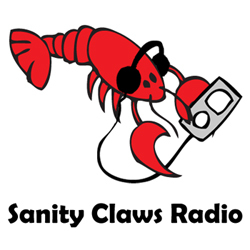 ← Sanity Claws Radio – E3 2015 Wrapup with Friend of the Show Johnny!